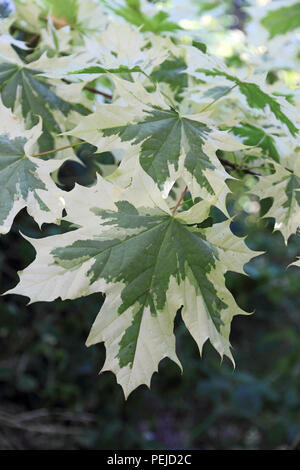 All I can say is, yes, it is a variegated Maple. Looking at the foliage it's probably a variegated Acer platanoides rather than Acer campestre. Probably 'Drummondii' for the silvery variegation but there are a couple of other similar variegated forms - 'Aureo-marginatum' and 'Variegatum' - that would be worth checking against. Sorry to hijack, but I'm just curious, do these kinds of images actually sell here? I mean, I have a number of this type of photo - leaves, etc, but hadn't put much thought into listing them. Is it a case of some day, someone might specifically need a photo of "XYZ"? Or is there a general market for this type of shot? If they are of good standard, true to the subject and accurately labelled (Genus, species and cultivar name if appropriate) then yes, there is a large market. 13 sales this month so far - all garden plants. Think gardening magazines, books, calendars, articles in newspapers, point of sale, internet promotion by nurseries etc, etc. Horticulture is worldwide and far bigger than other hobbies and most sports. Thanks. I'll keep that in mind - and plan some visits to Nurseries in the near future! Many thanks for your help, John. Will look into the above. At least I seem to have been going in the right direction! and take pictures of the plant labels I hope!